Andre Norton and I have a complicated relationship. It’s sort of like an acquaintance who was really fun a few times, and now you keep trying to become better friends even though they’ve never been quite so fun again. I love Norton’s Gryphon Trilogy, and for reasons that should suggest a really great author (beautiful writing style, intriguing characters with compelling relationships, complex world). And…it never quite works out with her other books. I actually liked Night of Masks reasonably well–but it’s no Gryphon Trilogy. It may have given me some insights though. 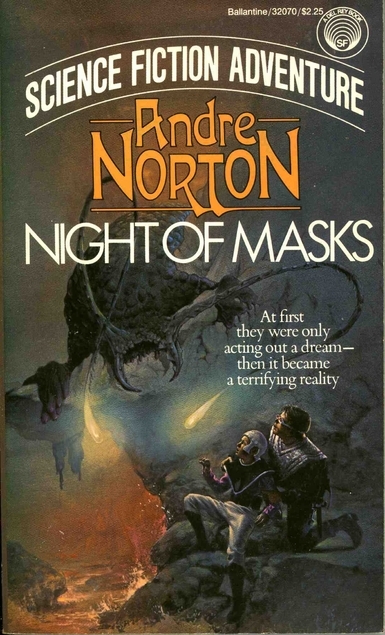 I’d practically sworn off of Norton, but I couldn’t resist this premise: a young man with a facial deformity has the chance at a new life by pretending to be a boy’s imaginary hero. So cool! Plus a sci fi setting, a mysterious conspiracy, and uncertainty about who to trust…it all sounds golden. And it really was decent. Just not as golden as I hoped. I think I figured out where the gulf may lie for me between liking (and sometimes disliking) and loving Norton’s books. Based on Night of Masks, she doesn’t appear to have any sense of humor. I don’t think there was a funny line in the entire book–and that makes it a little hard for me to love. I don’t exactly remember the Gryphon Trilogy being funny either (I’d have to reread it to really say for sure, since I wasn’t watching for that). At least it had some moments of relief from unrelenting grimness though–moments of wonder and hope and just relaxation for the characters (plus all those good things I mentioned up above). As I think Robin McKinley said once (paraphrasing here), your book shouldn’t be a steady stream of tension and stress. Just let your characters look at a tree now and then. So after all that analysis about what I didn’t like about Night of Masks, it really was a cool premise and an exciting story. Just…grim. And where does that leave me with Norton? I really should stop reading her. But…she has an enormous catalog, she’s a reasonably large name in classic sci fi (and a woman!) and I just never know–there could be another Gryphon Trilogy in there somewhere! I am *not* a humor writer when it comes to serious books; I can write a parody, but it’s really, really difficult for me to mix humor and gravity in one story. But what you said, about lighter moments, moments of hope and wonder, is what I’ve also been thinking. In my book, it’s pretty dark (not super dark, but you know, grim and a lot of sadness that the characters are dealing with). My characters are young teens, and in between the scary parts they share a snowball fight with a bunch of other children. This not only allowed me to introduce a lighter moment, where they’re just having fun and forgetting their troubles, but it also gives them something to look back on later, when everything looks hopeless and they’re close to going against the villain in the climax.